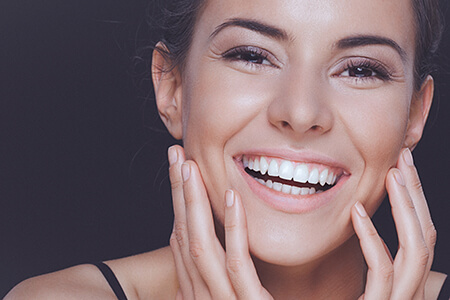 Cosmetic Teeth Whitening is one of the easiest and most effective ways to improve your appearance. Whiter teeth can boost your self-esteem and confidence. Years of drinking coffee, tea, cola, red wine, and smoking eventually takes their toll on teeth. The results are dull, yellowish-colored teeth. All whitening products contain peroxide either as carbamide peroxide (CP) or hydrogen peroxide (HP). Peroxide dissolves the organic stains in the tooth to change the color and produce a whitened affect. How Can You Achieve Your Desired Results? A take home kit of a customized tray and bleaching gel to be used at home; a custom-fitted tray is made to hold the whitening product directly against the teeth while lessening its contact with the gums. Some products have fluoride added to help prevent or treat mild tooth sensitivities. Results can be seen in seven to fourteen days. Complete results can be achieved in as little as a week or as much as several months depending on the source of the stain and the ability of the teeth to be bleached. The whitening procedure may last for up to three years or longer in some cases depending on personal habits.